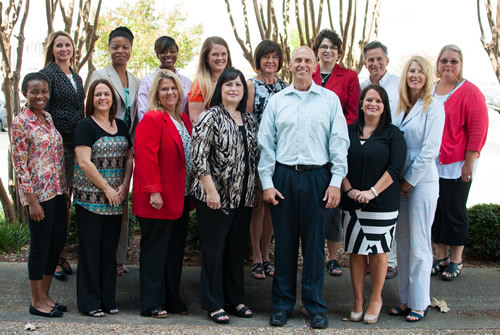 The staff of AFMC HealthIT leverages expertise in health information technology to enhance provider performance in transformative health care initiatives. AFMC HealthIT outreach specialists work with health care providers on two Centers for Disease Control and Prevention initiatives: chronic disease management and cancer screening. The goal of the chronic disease management project is to improve the overall health and disease management of patients diagnosed with hypertension and prediabetes through clinic coaching and utilization of the electronic health records. Utilizing a team-based care approach, the HealthIT team works closely with clinics to ensure patients are identified and monitored, sent patient reminders, and educated on the importance of disease self-management, medication adherence, healthy eating, and incorporating exercise into their daily lives. The cancer screening program seeks to improve cancer screening rates colorectal cancer, breast and cervical cancer using EHRs to set up clinic and patient reminders, identify patients in need of cancer screening, and ensuring cancer screenings results are returned to the primary care physician.